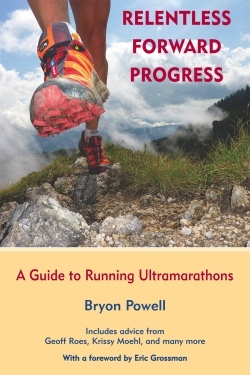 WRC member and talented runner Bryon Powell has written a book, Relentless Forward Progress. Read reviews and order it at amazon.com. Bryon was a DC lawyer and WRC regular until 2009, at which point he got smart, quit his job and headed West. He now resides in Park City UT and runs the blog irunfar.com. Did we mention that his team placed third at the 2009 Marathon des Sables? Congrats, Bryon, for living the dream. This fiesta occurred at Arlington Rooftop Bar & Grill Friday, May 13, from 5:30 – 7:30P. In attendance were usual suspects Steve Baker, Bruce Reynolds, Dan Yi, Rick Kennedy, Jessie Dingwell, Amanda Hamilton, Geoff (King? sorry! ), Diana Shannon, Christine Hackman, James Scarborough, and the Mayor of 34th & M St himself, John Kendra. No animals were harmed in the making of this movie. Gerry Ives was too busy racing to attend. This month’s “Blast from the Past” takes us back to May, 1986, when the WRC men won the DC Marathon Open Men team competition. Team members Vassili Triantos (2:40:36), John Potter (2:52:22), James Scarborough (3:14:30), and Jay Wind (3:20:16) crushed the competition, despite Jay Wind’s attempt to drop out of the race at the 16 mile mark and get on Gerry Ives’ bike. After the race Jay commented that he was the first unofficial race walker. Both Jay and James are still WRC members and still running marathons. Thanks for sending in results. Please continue to do so! PVTC Easter Classic 5k – Sat, Apr 16, 2011, Alexandria VA.
Christine Hackman, 47, 23:16, 9th overall (M+F), 1st master’s woman. Pikes Peek 10k – Sun, Apr 17, 2011, Rockville MD. Gerry Ives, 71, 44:26, 1st, 70-74 AG. 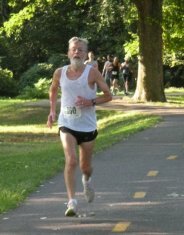 You Served, Now I’ll Run 5k – Sat, Apr 30, 2011, Alexandria VA.
Gerry Ives, 71, 22:46, 9th overall (M+F), 1st 70+ AG. Christine Hackman, 47, 23:18, 10th overall (M+F) , 1st 45-49 AG. Frederick Half Marathon – Sat, May 7, 2011, Frederick MD. Emily Buzzell, 25, 1:28:48, 5th overall, 2nd in 25-29 AG. Gerry Ives, 71, 19:19, 1st, 60+ AG. Christine Hackman, 47, 19:45, 1st master’s woman. Run for the Animals 5k – Sun, May 15, 2011, Wheaton, MD. Brian Savitch, (?) 18:43, second overall. Capitol Hill Classic 10k – Sun, May 15, 2011, Washington DC. Dan Yi, 30, 36:39, 7th male (8th overall). Congratulations to all our runners. Send us your results. fly down quiet pre-dawn streets. If you know of other workouts, please inform us! Enjoy the newsletter, not to mention the cachet conferred upon you when it’s learned you’re a member of DC’s finest running club? Send a check payable to Washington Running Club or WRC to James Scarborough, P.O. Box 545 McLean, VA, 22101. Please include your postal and email addresses with the check. Amount: Annual dues are $20 for individual and $30 for family membership, due in January. If you join on or after September 1st, you are paid for the remainder of that year and the entire following year. Washington Running Club: We run the nation’s capital! Have ideas for WRC activities, long run routes, etc? Just want to chat about running? Contact us at jrkinva@gmail.com or hackman.christine@gmail.com. We would love to hear from you!